This is an illustration I made for my 2nd year exam at the Animation Workshop. We had to create a story and universe, design 2 characters for it, and illustrate a scene from the story, showing both characters. My story is about an isolated town that is being haunted by the ghost of a legendary hunter who died 200 years earlier. He hunts down the other hunters from the town in the surrounding woods, in an attempt to punish the people who wrongly accused his loved one for being a witch 200 years earlier, and killed her. Her soul was trapped, and he will not rest in peace as long as she can't go with him. An ambitious girl, Amy, sets out to hunt down the ghost herself, after he killed her father. 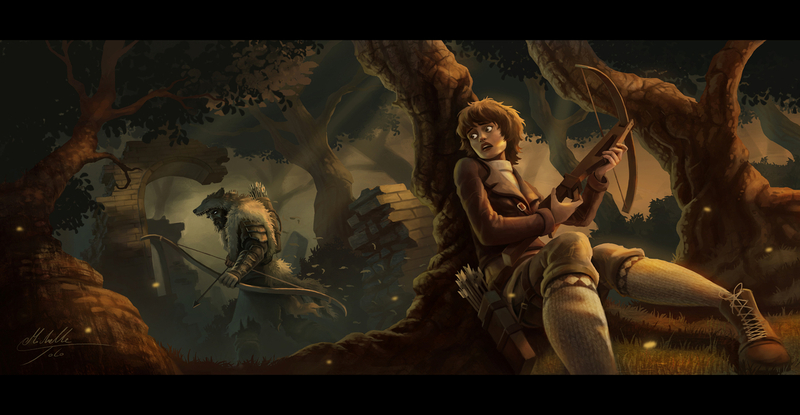 In her attempt, she struggles to remain the hunter rather than the prey, and this illustration shows a moment from the hunt between the two characters.